Sir Roger CASEMENT born Sandycove, Co Dublin 1864, executed 1916 in Pentonville Prison London, following a period in the Tower of London. Yes, Roger Casement was all of these things. In 1904 he produced the Casement Report exposing the brutalities of the rubber industry in the Congo Free State which was run as a personal possession of the Belgian King, Leopold II. Later, as Consul General in Rio de Janeiro he investigated the brutal activities of the Peruvian Amazon Company against the Putumayo Indians. 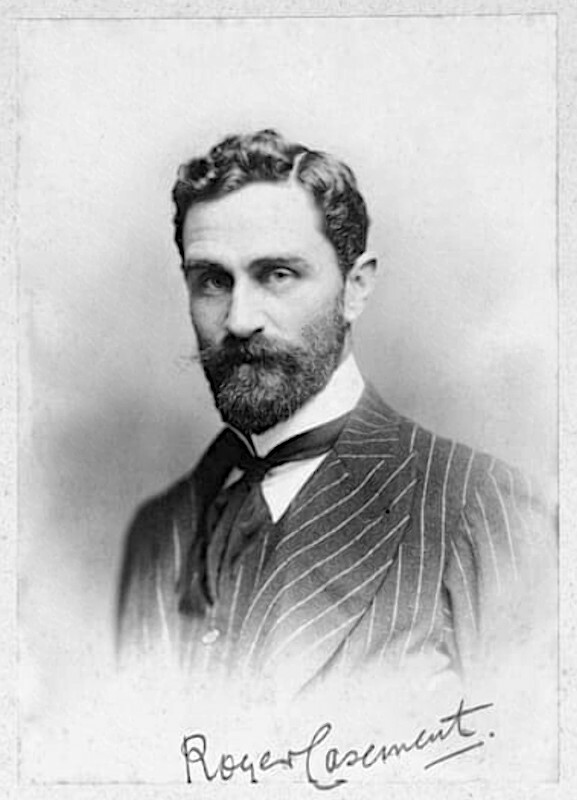 During the first world war Roger Casement tried unsuccessfully to raise an Irish brigade in Germany. On Good Friday 1916, three days before the 1616 rising, he was put ashore on Banna Strand from a submarine and was promptly arrested. A shipment of arms he had organised was intercepted on the same day. His trial attracted controversy and his conviction hung on the the placing of a comma in the Treason Act of 1351. As well as this, the British government secretly circulated sections of Casement’s Journals known as the Black Diaries, to undermine support by portraying him at the time as being sexually suspect. His remains were repatriated to Glasnevin, Dublin 50 years ago when he received a state funeral.